This afternoon we got to see a little bit of Austin. We drove through the corridor of quirky shops on South Congress to our first stop: the Capitol Building. 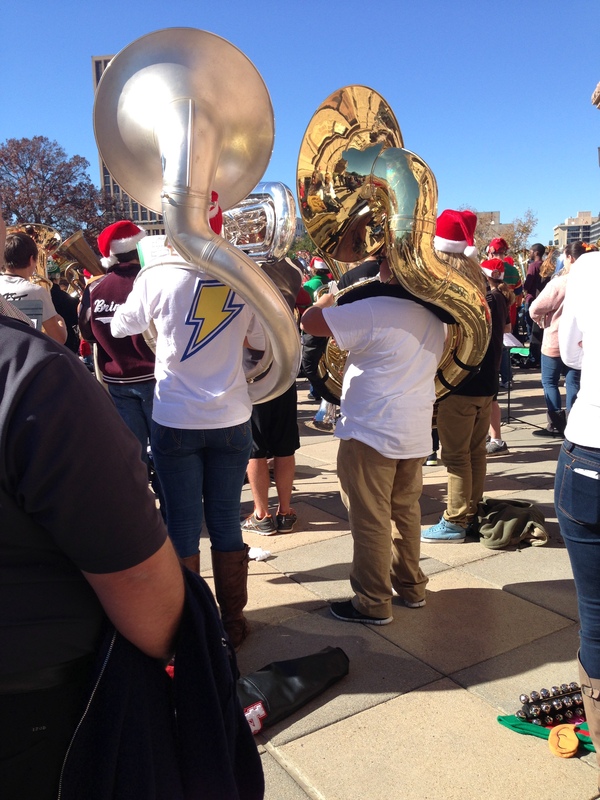 We actually rushed over once we read about a concert happening there today–a TUBA concert! It was hard to tell how many tubas or people were there but is was a wonderful event. There were shiny new tubas, ones that had some stories to tell, some in the hands of kids in band jackets and others on the broad arms of men with beards and salt and pepper hair. 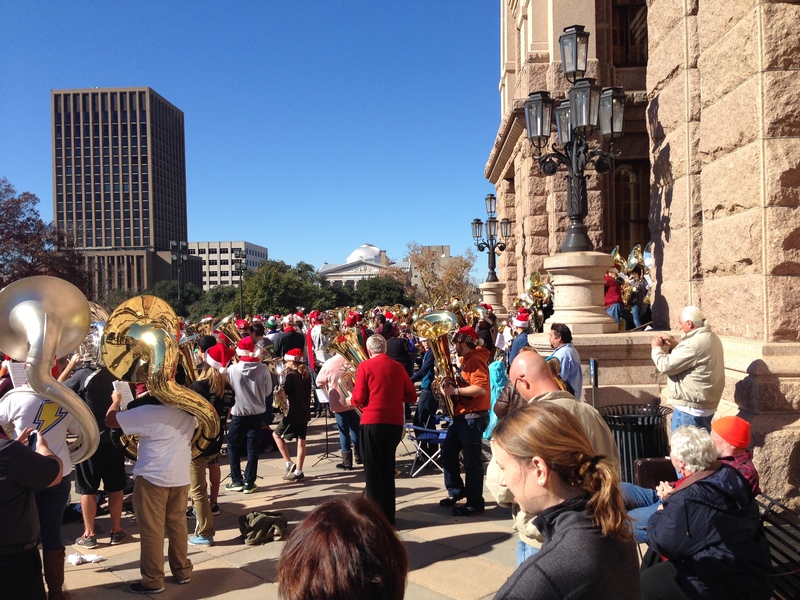 Every tuba was bellowing out hymns and Christmas carols while people sat in the grass and kids played in the sunshine. A little research revealed that this concert happens all over the country and has for the last forty years. It might have been the first flash mob. See if there is a concert in your area here. We listened for a while then walked thought the lobby to see the incredible dome and pictures of all of the Texas governors through time. I had T stop to reverently tip his hat to George W. Bush. After we picked up this year’s Texas Christmas ornament, we met my parents at Kerby Lane Cafe for some local color, cinnamon roll pancakes, and great conversation. On our way out we were caught in the middle of a disagreement between two friends. After one friend stormed out yelling, he apologized to us in the parking lot. Austin is still weird but everyone is so polite; Texas is such a mixed bag. After that, we went back to South Congress for some treasure troving. We sifted though Peruvian pillows and Mexican trinkets, bells from India and paper stars from Texas. I held land grant documents from 1910 and old mah jong tiles. We saw ancient books and old advertisements, typewriter keys, and even a box for face cream touting it’s magic ingredient: mercury. My Dad bought me a parachute man, you remember the kind–you wrap them up and toss them in the air. We tried on crazy hats, wooden shoes and crazy glasses at Lucy in Disguise. How cool is this old cowboy hat store fixture? I wanted this whole bowl, but I settled for a photo. There is so much pressure to make everything perfect, or at least make every moment good or at least “count” in some way when you are with family you don’t get to see every day. This day started out with the unexpected and then went to the silly. It was so hard to leave one another at the end. In short, we had a great day. I hope your family time is going the same way. Merry day before Christmas Eve. There is a lot of time to spend with family, community and friends. Pledge to enjoy it all until the season ends (and really beyond that, but I went for the rhyme)! Ending the Flurry of Hurry! I Like You! Like Us Too!